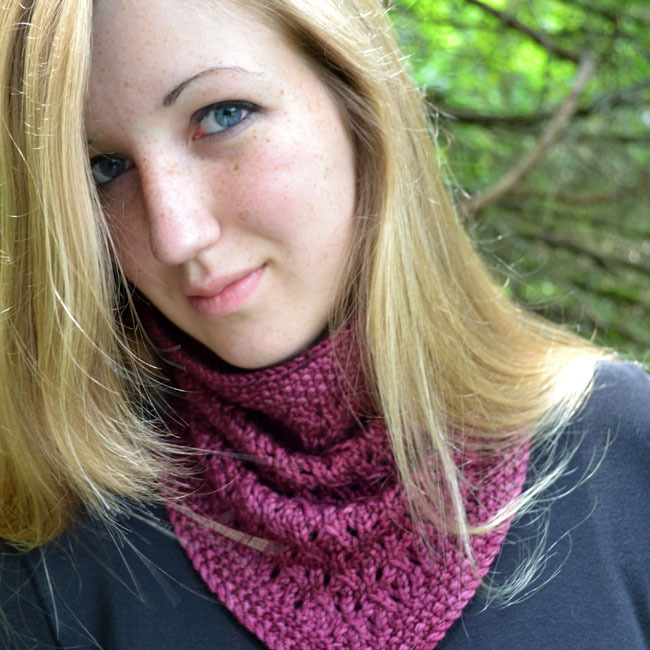 A petite cowl, Loganberry fits over an average adult head size of approximately 20” – 23” (51 cm – 58.5 cm). The blocked cowl circumference is approximately 18” (46 cm), while the length is about 13” (33 cm). This downloadable, PDF pattern has been professionally tech edited and test knit to reduce the potential for error. The pattern is charted, but also includes complete written line by line instructions so the ability to read a chart is not necessary to work this pattern. The Loganberry Cowl is worked from the bottom up using a combination of knitting in the round and short rows. This pattern utilizes the shadow wrap method of working short rows. The standard wrap and turn method of working short rows is not well suited to this pattern. If you haven’t worked shadow wraps before, Alice Yu’s Socktopus Unplugged blog has a wonderful photo tutorial on how to work this awesome short row method. Thanks, Alice, for providing such a great resource! 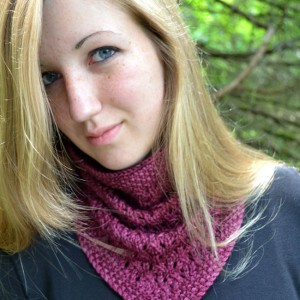 The Loganberry Cowl pattern PDF includes written instructions on how to work the shadow wraps as well. My sample cowl was knit using 1 4 oz/113 gr (200 yds/183 m) skein of Dream in Color Classy with Cashmere (70% superwash merino wool, 20% cashmere, 10% nylon) in Magic Orchid. A truly lovely yarn to work with, Classy with Cashmere is soft, squooshy, with just a hint of a sheen to it. Full pattern details for the Loganberry Cowl can be found here.